In this episode, I welcome Michael Bungay Stanier, founder and Senior Partner of Box of Crayons. 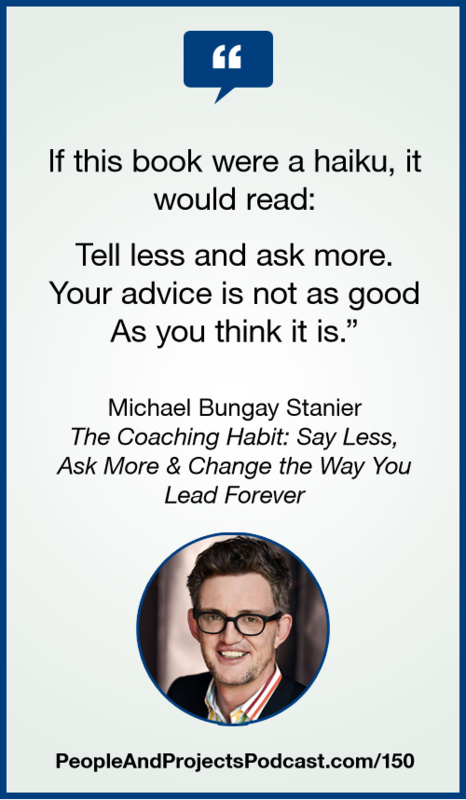 Michael is the author of a new book that details how project managers can be more effective coaches. In The Coaching Habit, Michael proposes that coaching is not a formal event, such as a one-on-one meeting. Rather, it's something we can do regularly, informally, in 10 minutes or less. Conflict comes with the role of leading people and projects. Our e-learning program entitled Beyond the Rock and the Hard Place is designed to help you learn how to negotiate conflicts in more productive ways. Learn more at http://courses.i-leadonline.com/courses/beyond-the-rock-and-the-hard-place. QUESTIONS ANSWERED by Track Jackit is licensed under a Attribution-NonCommercial-ShareAlike License. TELL ME WHAT'S ON YOUR MIND by Allah-Las is licensed under a Attribution-NonCommercial-NoDerivatives (aka Music Sharing) 3.0 International License.